The Rev. 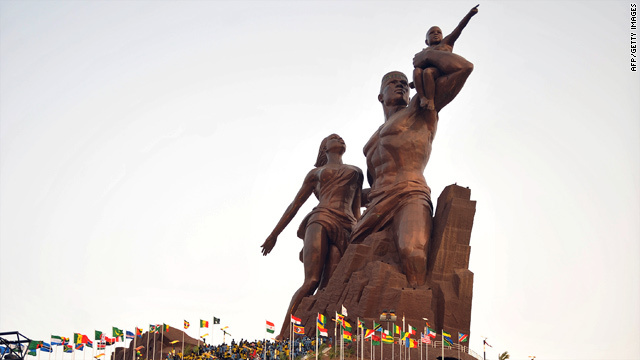 Jesse Jackson: "This is dedicated to the journey of our ancestors"
(CNN) -- Senegal on Saturday unveiled a colossal statue during a lavish ceremony amid reports of criticism over the monument's construction at a time when the western African nation is struggling financially. The 164-foot structure -- about a foot taller than the Statue of Liberty -- shows the figures of a man, a woman and a child, arms outstretched, facing the Atlantic Ocean. President Abdoulaye Wade says the statue, which he designed, is a monument to Africa's renaissance. Critics say the opulent copper structure is merely the product of the president's own self-indulgent vision and poor governance. And though it dominates the skyline of Senegal's capital, Dakar, the monument falls far short of the president's claim that it is the world's largest. Several other statues are listed by multiple sources to be taller, including China's Spring Temple Buddha, which stands just under 420 feet. Opposition group Benno Siggil Senegal called on the Senegalese people to "refuse to associate themselves with a fraudulent scheme designed to satisfy the fantasies of Abdoulaye Wade and to lay the foundations of dynastic reign of Wade on our country," according to the African Press Agency. A spokeswoman for the president sought to downplay criticism Saturday, saying the statue -- valued at roughly $20 million -- was made possible by a land deal between Wade and North Korea, and that proceeds from the monument will benefit Senegalese children. The statue is "an affirmation to be proud of Africa -- to be proud to be black," said spokeswoman Gia Abrassart. This monument does not belong to Senegal. It belongs to the African people wherever we are. Other dignitaries in attendance at Saturday's ceremony, which coincided with the 50th anniversary of Senegal's independence, echoed that message. "This renaissance statue is a powerful idea from a powerful mind," said the Rev. Jesse Jackson in remarks to the crowd of hundreds waving flags at the foot of the lighted monument. "This is dedicated to the journey of our ancestors, enslaved but not slaves." Malawi President Bingu Wa Mutharika praised Wade for constructing a monument that represents Africa. "This monument does not belong to Senegal," he said. "It belongs to the African people wherever we are." North Korea, which made the statue's construction possible, also sent Wade a congratulatory message, the state-run Korean Central News Agency reported. In exchange for the money to build the statue, North Korea received a piece of Senegalese land, Abrassart said. The message from top North Korean official Kim Yong Nam "expressed belief that the friendly and cooperative relations between the two countries would grow stronger in various fields in the future, too," according to KCNA. CNN's Sarah Aarthun contributed to this report.